Kevin Kester, a fifth-generation California rancher and president of the National Cattlemen’s Beef Association, said, “We hope that the Federal Motor Carrier Safety Administration sees the support of many members of Congress from across the United States for this petition, and recognizes the need for flexibility. A bipartisan coalition of 59 House members led by House Agriculture Committee ranking member Collin Peterson, D-Minn., and Reps. Ted Yoho, R-Fla., and Roger Marshall, R-Kan., submitted a bipartisan letter to the Federal Motor Carrier Safety Administration in support of a petition to waive livestock haulers from certain provisions of Hours of Service rules. The petition, which was submitted by the National Cattlemen's Beef Association, Livestock Marketing Association, American Farm Bureau Federation, American Beekeeping Federation, American Honey Producers Association, and National Aquaculture Association, requests increased driving hours for livestock haulers in exchange for additional training designed by FMCSA. 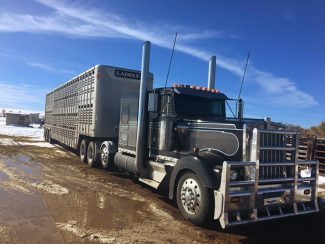 "Current hours of service regulations do not accommodate the unique needs of livestock haulers," Peterson said in a news release. "This petition will allow them to deliver agricultural products to market more effectively while maintaining their proven record of safety." "The safe transportation of livestock is an essential part of feeding America," Yoho said. "This petition would modify the current regulations so we protect the safety of both haulers and livestock en route to their final destination." "When livestock and other live animals are transported, it's important to get them to their destination safely and without delay or disruption," said American Farm Bureau President Zippy Duvall. "Safety for the driver and others on the road is a priority. That is why we are petitioning DOT (the Transportation Department) to adopt modern fatigue-management practices that provide the same or greater level of safety while avoiding unintended and unnecessary stress on the animals entrusted to our care." Kevin Kester, a fifth-generation California rancher and president of the National Cattlemen's Beef Association, said, "We hope that the Federal Motor Carrier Safety Administration sees the support of many members of Congress from across the United States for this petition, and recognizes the need for flexibility. We look forward to continuing our work to deliver more flexibility for haulers while maintaining a very strong safety record for fellow highway travelers."